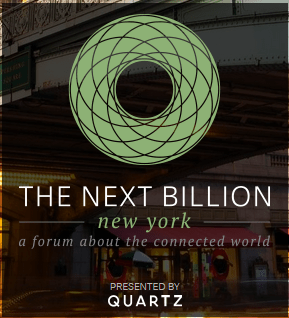 Today, Wednesday November 5 2014 Quartz will be holding a full day conference The Next Billion – one of a global series exploring the next generation of technologies and strategies that will help companies and individuals around the globe prepare for the next billion internet users to come online. Speakers include representatives from Microsoft, SmartThings, goTenna, Harvard Law School, the Ford Foundation, and Al Jazeera America. The sold out event will be webcast live via Livestream.